QClearly your party is polarized by Mahinda loyalists and Maithree loyalists which resulted in the electoral setbacks to the SLFP. As a stalwart supporter of the Mahinda side, do you see any positives in this government led by President Maithripala Sirisena? "We salute public opinion and we abide by it. There will be no movement to regain power when people have clearly made a choice." QAgain, your party is divided about helping UNP form a national government. Absolutely. Only 3 members of the Central Committee opposed but the motion was won by a huge majority. That is the party’s decision and in a democracy you have to respect and abide by that as a legally bound party member. But we mustn’t forget that the public gave us this mandate to establish an alternative to the UNP government, not to go into a coalition. In that case the party has become politically irresponsible for the promises it made to the public. I believe President Sirisena will allow the supporters to form a coalition with the UNP and let the opposing members act upon their free will and remain in the opposition. QWhat happened to the 5.8 million votes you won eight months ago? The voting percentage dropped by nearly 14% in this election than in the previous presidential election. It can be clearly seen that the majority of our votes were lost in that. I believe the unity of the party or the lack of it, directly affected the result. President Sirisena’s certain speeches and actions leading up to the election also had a direct effect of a minus voter turnout. And former president Chandrika Kumaratunga openly pleaded with the party supporters to vote for the animal. In some districts, our own candidates were engaged in a battle of preferential votes. I believe all the reasons above contributed to the number of votes we got this election. "Supporting them at correct times and constructively criticizing them when their actions become critical are very important parts of a true public representative sitting on the opposite side, inside the Parliament"
QIs the pro-Mahinda UPFA party trying anything of a sort to regain the power? We salute public opinion and we abide by it. There will be no movement to regain power when people have clearly made a choice. It is time to represent the Opposition in the Parliament in the public interest to the fullest and that is what we are planning to do as the UPFA. QWill you be interested in a coalition government if invited? Definitely not. As a politician it is our duty to play public representative in various forms. As a member of the parliament and sometimes as a cabinet minister or even a citizen. This time it has come down to the role of member of the opposition and I fully intend to do my duty as an opposition member of the Parliament. That doesn’t mean you disagree with everything the government does on a general principle. Supporting them at correct times and constructively criticizing them when their actions become critical are very important parts of a true public representative sitting on the opposite side, inside the Parliament. Besides, the past six months have clearly shown this whole myth of coalition government is meaningless and I doubt under this regime a new coalition would be any different from what they practiced in the last few months. 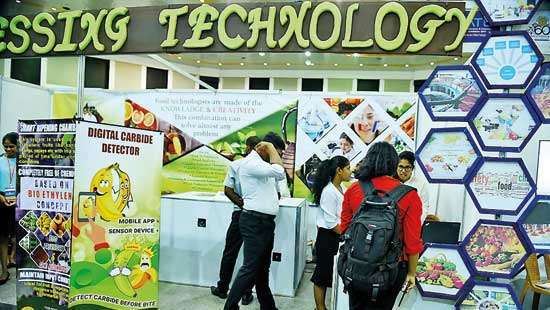 QDo you think Mahinda Rajapaksa legacy has come to an end? His legacy cannot be erased from the history of our nation by any person or group, ever. "Voting percentage of the UPFA dropped by nearly 14% in this election than the previous presidential election." 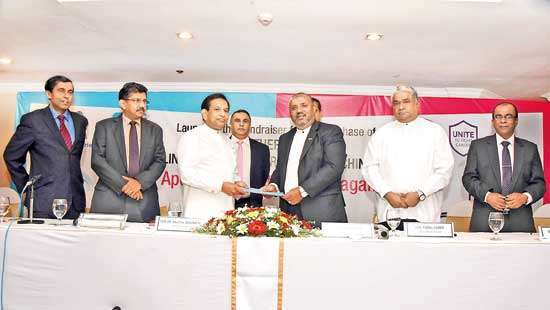 QWhen the UNP and UPFA national list members are compared, the UPFA list has been under heavy criticism and is a sub-par list compared to the UNP. Do you agree with that? Despite our differences, I want to say hats off to Prime Minister Ranil Wickremesinghe on his stern but democratic stance on naming his party’s national list. In naming several candidates who were rejected by the public and lost the election, the UPFA list has now become infamous. President Chandrika Kumaratunga’s leadership set the precedent to this unethical practice when she first named two losing candidates on the national list of PA and opened them a back door to enter the Parliament. She went further in 2004 by including Mervyn Silva in the national list after he became the last placed candidate and only garnered 2240 preferential votes. Progressive citizens of Sri Lanka may feel this naming of UPFA national list is ten times worse than CBK’s actions. QWhat do you think of the decline of JVP and Field Marshal Sarath Fonseka in this election? The public do no longer accept JVP as a revolutionary party. 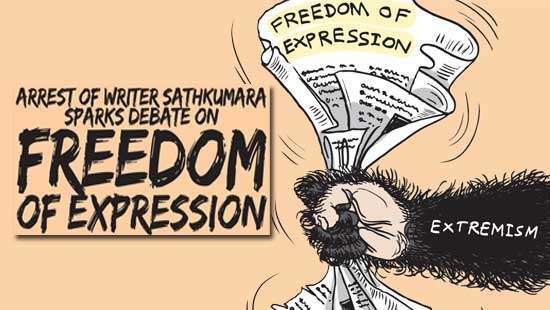 When Sarath Fonseka became Field Marshal, he could have made an honourable exit but he was trapped by this country’s political opportunists and pawned into self destruction and his own fall from grace. Unfortunately he was sacrificed inhumanely by bankrupted political movements to save their own face. I still accept and respect him as a war hero just as I respect Gotabhaya Rajapaksa, Wasantha Karannagoda and Roshan Gunathilake. Personally I carry a sting of pain inside my heart about the injustice caused to him by our regime. 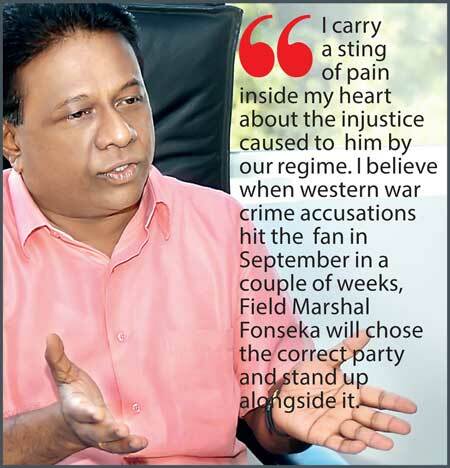 I believe when western war crime accusations hit the fan in September in a couple of weeks, Field Marshal Fonseka will chose the correct party and stand up alongside it. QThe war crimes report is due and what do you think the fall out would be like? QThe TNA leader Rajawarothiam Sampanthan was elected as the Leader of the Opposition in the new Parliament. What are your thoughts on that? It is not a public secret that this was the result of a furious campaign staged by the Diaspora but not any effort taken by party seniors of the TNA. Politicians who make a livelihood out of the support from Tamil Diaspora will strongly make a case for it and even justify it. TNA is a democratic movement. Mr. Sampanthan and Mr. Vigneshwaran are real gentlemen and I know that very well. But their power is being taken away by separatists and they no longer can voice an opinion of their own or function and the TNA cannot act as a democratic mechanism. Now it’s only a democratic front for separatist Tamil Diaspora. QThe minority vote had a major role to play at the polls. Do you agree? No I don’t agree. It could be one of those reasons but definitely not the main reason. We lost Gampaha by 26,000. Kegalle by 20,000. Polonnaruwa by 15,000 and Matale by 10,000. We lost those 4 districts due to the reasons I mentioned before. If we had won those, then there would have been a swing of 10 more seats for us in Parliament and we would have been sitting pretty with 106 seats. QDon’t you think this nationalistic nature of your party won’t be enough to win an election again in Sri Lanka? We invited the public to create a modern Sri Lankan nation. One nation under one flag. People with racist ideologies may not have voted for a unified Sri Lanka. But I have a dream that one day, preferably in the near future; Sri Lankan ethnic groups will have the will power to vote for a unified Sri Lanka, impartially despite their racial, cultural and religious background. QIt is said that this is the most peaceful election ever in post independent Sri Lanka. Do you believe that? Despite a major number of blatant election law violations caused by the governing party in my district, I agree with you and that credit should completely be attributed to the Elections Commissioner. QThis election campaign saw many politicians taking their campaigns to cyber space and using social networks. What are your thoughts on this new trend? This is called evolution. Mark my words; this is the last election campaign in the history of Sri Lanka with banners, cut-outs and posters. With the rapid development in technology and rising popularity of social media, 2020 general election campaigns will completely battle it out on Facebook. In the past a student asked President Barack Obama a question when the US president visited his high school.”Sir, what would be your best advice for me if I would want to become the US president in the future?” Obama said, “Maintain your Facebook account”. I think that answer sums it up about where the political campaigns will be heading in the future. QWhat do you think is the biggest challenge for President Sirisena? He has two challenges. First is to unify SLFP under his leadership. I plead to his team to not get him suckered into making mistakes like the UPFA National List. If he is unable to unify SLFP, then nothing can prevent him from going into history as the most unsuccessful leader of the party. I wish him to succeed in that task with his 40 years of experience as a stalwart of the SLFP, despite imbalanced forces influencing him. The second challenge is to beat these war crimes accusations against Sri Lanka, then establish national security and guide the nation into a rapid path of development. QHow do you analyze US Deputy Secretary of State Nisha Biswal’s recent visit and her pledge to support Sri Lanka at the upcoming 30th UNHRC sessions in Geneva ? I feel just like sage Asitha did when he held prince Siddhartha in his hand. He smiled first and then cried. I am very suspicious about US intrusion and their sudden pledge to change sides in the Geneva summit. US were looking for a strategic base in the Indian Ocean for a long time to neutralize Indian and Chinese threats in that area. Even though I am short of any proof at this point about what they are actually trying to do, this visit and their push to make a US friendly opposition by promoting TNA, reminds me that an exactly similar thing happened in Kenya after the 2007 elections and the series of incidents that followed to overthrow President Uhuru Kenyatta. You may remember, in Kenya they made US friendly Raila Odinga as the opposition leader and used him to take President Kenyatta to ICC in Hague. If it wasn’t for the unified effort of the majority of African States, President Kenyatta’s fate could have been very unfortunate. As many of us know, United States government’s dislike towards nationalist leaders and their establishing puppet regimes to obey them and follow them at any cost, is no secret. QWhat can you say about your election campaign this time that makes it stand out among the others? I was the first mainstream politician in post independent Sri Lanka to run an eco-friendly election campaign. This time also I ran a completely “environment friendly green campaign” sans, posters, cutouts, banners, flags etc, and I believe the earth loving people of Matara would have identified my concept and they have reacted. QYou are a simpleton coming from humble beginnings and in a time where multi millions are spent on campaign budgets, how did you manage to pull off this miracle with such limited means? My election campaign was armed with only one leaflet made out of recycled paper. Again I used an environment friendly bio-degradable substance. No worries for mother earth. My parents were school principals and I come from a rural middle class family. But my parents have showered me with wealth, which is the ideologies I stand for even today, against the greatest adversaries. I defend them like my life at any cost and that was the message I wanted to get across to the public. I used only this leaflet and a Facebook fan page to promote my campaign. It shows that on an average, people are decent and most likely to make a correct choice at most times. Just like President Lincoln said, “You can fool some people all the time and all the people sometime. But you can’t fool all the people all the time”. I believe that. QCongratulations on your victory. After a hiatus of nearly 15 years in competitive politics you not just won your electorate, your district under your leadership, but also became the number 1 choice by the people of the Matara district by a record number of preferential votes. What is the secret for your success? In 1993 I came to the political arena pleading to vote for humanity and my ideologies have not change during the past two decades and I believe people identified that and that’s why just like I became number 1 in the previous elections I participated, even after a hiatus I was chosen to top the list by general public. I want to make this an opportunity to thank my fellow citizens from Matara District for their support and approval.